This review contains spoilers for the film Indiana Jones and the Last Crusade. If you haven't seen it, where have you been for the last 30 years? How do you improve on a classic character like Indiana Jones? He's witty. He's handsome. He's intelligent. He's brave. He's ressourceful. He's....named after his father? 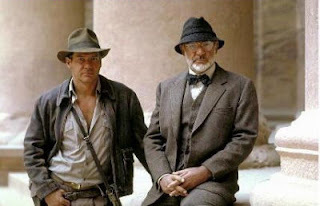 In the third installment of the Indiana Jones franchise, we discover that Indy's real name is Henry Jones Jr, named after his father, portrayed by the inimitable Sean Connery. "We named the dog Indiana!" Connery exclaims. And in that moment of levity, the origin of the eponymous hero's name is de-mystified. The Last Crusade is undoubtedly my favourite film in the Indiana Jones series, in no small part because the on-screen chemistry between Connery and Ford was so good. We discover that Indy has some hang-ups regarding his relationship with his father. Junior replies to his father's chiding with an exasperated "I know, dad!" more than once. Not to play armchair psychologist to a fictional character, but these issues may be at the root of Indy's desire to be the best in his field. Can a son be as good as, or better than his father? Stagg Jr. is a product of the Buffalo Trace distillery. The name comes from another product, George T. Stagg Bourbon, a whiskey named for the über-successful Kentucky salesman/business man/distillery founder. The annual release of George T. Stagg as part of the Buffalo Trace Antique collection is a highly anticipated event. George T. Stagg is a vatting of bourbons that are at least 15 years old, so a limited number of bottles are produced and released every year, usually in the fall. I wasn't fortunate enough to "win" the chance to buy a bottle in the LCBO's lottery this year. Stagg Jr. is made from the same mashbill as George T. Stagg, but is not quite as aged, reportedly containing 7 to 10 year old whiskey. 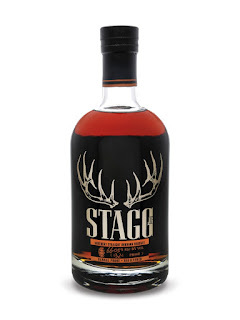 Stagg Jr. is still somewhat limited, but is not a lottery product like its parent product. It tends to come around several times per year, and is more affordable than George T. Stagg. The mashbill is the Buffalo Trace Mashbill #1 (low rye: less than 10 % rye) and this bourbon, from Batch 8, is bottled at a hefty 64.75% ABV. This review is from a sample generously provided by a friend. His bottle was opened Oct 17, 2017, and the sample poured on Nov 8, 2017. With water, the fruitiness is pushed back. Caramel pops out of the glass on the nose alongside a freshly-shucked corn note. With a bit of time, the nose becomes much oakier and an aroma of fresh pipe tobacco emerges. On the palate and finish, there is far less fruitiness with water added. It’s replaced by rich, sticky toffee and floral vanilla, while the chocolate on the finish becomes more like milk chocolate.This is terrific both ways. I've never had George T. Stagg, so I can't comment on the quality of Junior's parent bourbon. It may be the Henry Jones Sr/Sean Connery of bourbon, or it may be Danny Tanner/Bob Saget of the Buffalo Trace family for all I know. However Stagg Jr. is excellent on its own, much like Indiana Jones. It's a bruiser, but even with water added the nuance and wide range of flavours shine through and the bourbon maintains its exceptional quality. Recommended.